7 Things that Might Surprise You About Nuns. — Hey Eleanor! But first, let's do some word association. I say Disney World. What's the first thing that comes to mind? Mickey Mouse, over-priced crappy ice cream, Pirates of the Caribbean, maybe waiting in lines. If I say Minnesota, you probably think winter, Paul Bunyon or Fargo (which, btw, is actually in North Dakota). The sisters came into my life (really, my entire family's life) via my uncle Brian, who moved down the street from them about a decade ago. They live North Minneapolis' Old Highland neighborhood-- a place most Minnesotans only know from bad stories on the news. What you probably don't know is that it's a very tight-knit, community filled with smart, interesting and dedicated people (and beautiful houses!). Anyhow, they've become a second family to Brian, and by proxy, the rest of our family. Since the early 80s, the Mogrens have shared Thursday night dinners, where everyone gets together for a massive meal. My dad has 11 brothers (no sisters. My poor Grandma! ), so when we get together, it's 25 people at minimum. 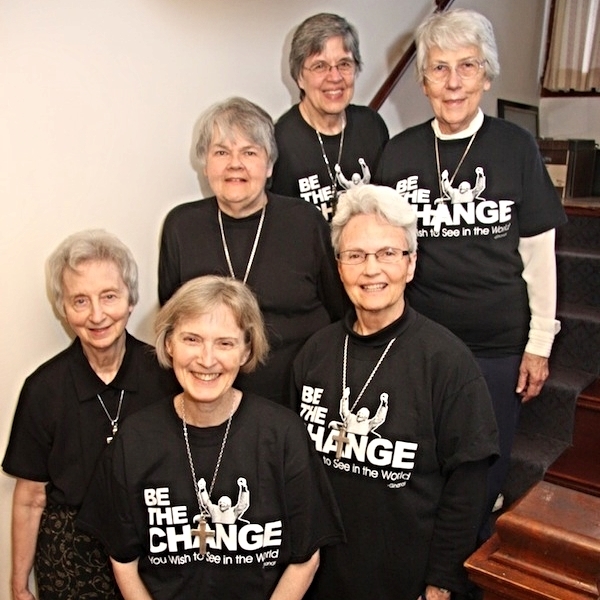 Two winters ago, we invited the Visitation Sisters to join us for dinner (and it was, as we say in Minnesota, a hoot). Visiting a monastery (#224) was definitely a new experience for me. Although my dad's family is Catholic, we were raised Lutheran-ish. However, I've always been fascinated by the Catholic church. The rituals, the old-school nature of it all, and of course, the priests and nuns. I am so curious about the men and women who forgo marriage, children, romance, money and independent living because of a calling to serve God. I can only assume that a person's desire to be a priest or a nun is not much different than my desire to be a wife, mother and/or writer. When I say monastery, you probably picture something out of the Sound of Music or the Davinci Code. The Visitation Sisters' monastery is a 100+ year old Victorian home. Before the sisters bought it, it was to be demolished. Just keep that in mind as you drool over the original woodwork showcased in these pics. It's amazing what elbow grease (plus good connections with a contractor) can do. Hey, just because you're a nun doesn't mean you don't enjoy a nice glass of vino. Josh and I even brought over some of the wines we were considering serving at our wedding for the sisters to critique. Heck, Jesus turned water into wine, which I personally think it the party trick to end all party tricks. 2. The conversation wasn't all religious. Not even close. We talked about work, family, movies, relationships, food and all sorts of other regular stuff. Sure, religion came up...but mostly because a good chunk of the people in attendance chose it as their vocation. Just because these ladies have committed their lives to serving God doesn't mean they aren't human. We talked about the dynamics in the monastery, and yes, even when you are a nun and in your 60s and beyond, you're still ticked when your roommate never washes her dishes or cleans the bathroom. However, they still get to experience the best part of having a roommate, which is always having someone there to share your highs, lows and whatevers with. They're a family. And it wasn't from my family... it was from one of the sisters. It was a swear you can say on TV, so not too bad. Regardless, I really enjoyed hearing it! 5. Sr. Mary Frances' dad was a major league ball player. Sr. Mary Frances and Uncle Whitey.... these two are pretty tight. When Josh and I decided to tie the knot, appointing our officiant was pretty easy. Neither of us are particularly religious. We settled upon our good family friend Judge Mary Hannon to do the deed. We knew she'd be awesome-- the perfect mix of funny, smart, personal and serious-- and we were pleased with our decision. That being said, both Josh and I found ourselves answering the question, "Who is blessing the ceremony?" (or something to that effect) a few times that evening. It didn't feel judgmental, but we both answered very vaguely: "Oh, our friend's mom," or "A friend of the family." Even though Josh and I had no qualms about being married by a judge, neither wanted to admit it to a nun! I'd be lying if I said I wasn't a little thankful when they said they'd add us to their daily prayers (and give us some extra prayer oomph on our wedding day). Whether you're running a family of four or living in a monastery, buying in bulk just makes sense. Nuns, they're just like us! A huge thanks to the Sisters for inviting our clan to dinner. I talked to a few of them about doing an Everyday Eleanor interview with me later this year, so if you have any questions you've always wanted to know about being a nun (but were too afraid to ask), let me know!